Good afternoon and happy Saturday. I received a very happy e-mail while I was away on holiday recently, and I'm now a proud member of the Lost Coast Designs/Carmen's Veranda Design Team, Woo Hoo! Their challenge this month is 'favourite background techniques' One of my favourites is 'blown alcohol ink' and here's what I've made. 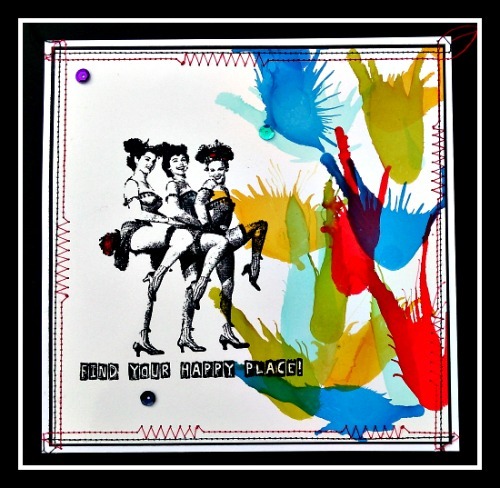 These Showgirls have long been a favourite of mine, whereas Happy Place is a new clear stamp over at Carmen's Veranda. It's over to you now, we all have a favourite background technique (or 2 or 3) so visit us on the Portal To Creativity and join in. Love those colourful splats - and what a fabulous stamp. Huge congrats on your new DT post - they're lucky to have you! Fantastic and like Alison - I too love your colorful spats! Woo Hoo is right - congratulations and once again I agree with Alison - they are very lucky to have you!! Love the text stamp too, beautiful. First, a huge congratulations on your new DT gig over at Lost Coast/Carmen's Veranda! I have long been a fan of both! You will make a wonderful addition to their team. I love your splashes of color hear that just add to the happy place that your art takes me here. Applause! Applause!